Project Description: To address major shortcomings with the City’s wastewater treatment plant, the City entered into a Mutual Agreement and Order with the State of Oregon DEQ requiring the City to make improvements to the wastewater system. Westech was retained to assist the City with the facilities planning process. One of the key elements of the plan was to rehabilitate major portions of the collection system to address faulty collection piping, reduce infiltration and inflow into the system, and to improve the conveyance capacity of the system. Upon completion of the facilities plan, Westech assisted the City with the acquisition of a funding package consisting of grants and loans from the USDA Rural Utilities Services and Oregon Economic and Community Development Department. Westech prepared the design for the rehabilitation of approximately 12,600 feet of sanitary sewer mainline including service laterals and manholes. Due to the existing sewer mainlines being relatively shallow and poorly graded, open cut construction was chosen as the preferred rehabilitation approach. In addition to the gravity sewers and service laterals, the project also included the design and construction of a siphon under the Calapooia River. The siphon was designed with a low flow pipe and a high flow pipe to maintain scouring velocities over a wide range of flows to minimize solids accumulation. 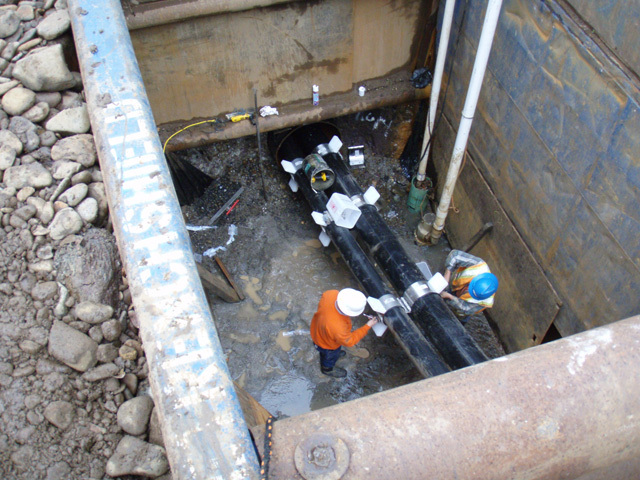 The siphon pipes were installed under the river bottom in a casing installed by auger boring. Based on discussions with the City, very little solids are removed from the pipe during routine cleaning activities.